This seasoning herb is an annual plant, which grows very rapidly in mild climates. If you plant coriander seeds from the grocery store it can go into flowers and seeds quickly in hot weather conditions, therefore always plant a variety that is slow to bolt such as Leisure. 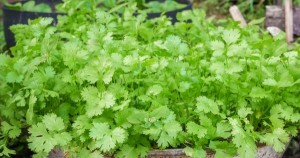 In Latin America and in the US the leaves and shoots are called “cilantro” the Spanish translation of coriander. The fragrant young leaves and shoots are used as a seasoning green in stir-fry or soup. Dried leaves and matured seeds are also used as seasonings in Indian cooking.